This entry was posted on November 29, 2010 by iheartfilm. 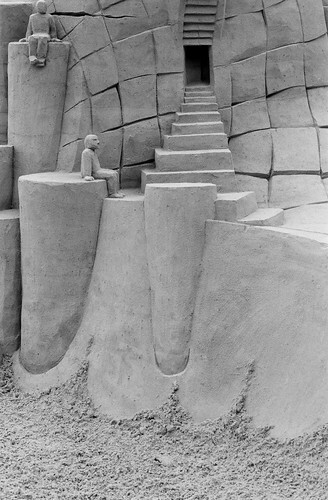 It was filed under Black and White, Ilford Delta 100, sculpture and was tagged with Black and White, film, Ilford Delta 100, nikon f100, noritsu koki, north american sandsculpting championships, photography, sandsculpture, sculpture, virginia, virginia beach. The art is on so many levels: the architecture, the ability to work in sand and your photography. I agree with burstmode – I love it when artists of different genres come together (even inadvertently) to create something. What an amazing sand sculpture and nicely captured I might add! Great shot, you’ve got all the details and really captured the feel of quiet place. The stairs lead you in and make you wonder what’s inside. I think Dan Belcher was lucky to have you there so that his work will stand forever. A very interesting sculpture and your shot took good care of it. It’s obvious that you understand the importance of grayscale. That is the stoniest looking sand I’ve ever seen. Wicked.